If you are planning a Balearic Island holiday, the following information may help by giving you an overview of the Balearic Islands and the 4 islands which make up the archipelago. Each of the four main Balearic Islands – Mallorca, Menorca, Ibiza and Formentera – offer a variety of landscapes, from lively beaches and rocky coastlines, to lush subtropical interiors. Holidays to Mallorca are known for package tourism, but more accommodation facilities are appearing in more rural areas such as the Tramuntana mountains. Mallorca’s capital, Palma, has a culture and history as well as restaurants and nightlife which is comparable to any mainland Spanish city – you will never be bored on a holiday to Mallorca. The 2nd largest of the islands and Menorca – a holiday in Menorca is at a more sedate pace of life than Mallorca. 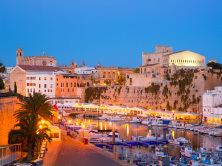 Menorca’s capital, Mahon [or Mao], and the former capital, Ciutadella, are both busy and cosmopolitan towns with their own distinct architectural and cultural heritage, and a restaurant and nightlife scene less hectic than Palma. A holiday in Menorca will mean that you will benefit from some exquisite beaches, bays and tiny coves while the island’s interior has an impressive number of prehistoric Talayotic structures. An Ibiza holiday is world-famous for its nightlife and club culture with clubs such as Space and Manumission. There are, however, quiet inland towns and its older attractions such as the walled Dalt Vila in the capital. Ibiza is the less verdant of the Balearic Islands, but its rocky coastline conceals some beautiful beaches and coves. 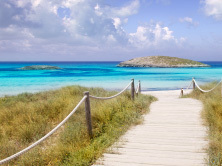 Formentera is a haven for walkers and nature lovers and accessible by boat from Ibiza. Most of the tourist resorts are on the coastline and the larger beaches receive boatloads of day-trippers from Ibiza, but if you visit its quieter beaches and almost anywhere at night, you will be rewarded with a great sense of peace and quiet. The quietest and most peaceful of the Balearics and ideal for visitors looking for relaxing days on the beach, a good meal, and an evening stroll rather than a hectic nightlife. Best know for its beaches, this is ideal for family holidays. The Balearic Islands boast a rich and diverse architectural heritage. Sights worth seeing on your Balearic Island holidays range from prehistoric chamber tombs to aristocratic mansions and palaces. Palma has the most to see, notably the fine Gothic Cathedral which was renovated by Antoni Gaudi, while Menorca has many remains from the Talayotic period. Ibiza’s houses [which were influenced by the Arabs] have inspired some of the greatest architects of the 20th century. Stone-built windmills are a typical feature of the Balearic Islands. Early mills were used to grind grain, later they were used to pump water. Most stone-built mills are no longer in use and are slowly falling into disrepair. Some have lost their sails, and now resemble watchtowers. Others have been converted into restaurants, with the machinery and millstones serving as tourist attractions. Due to the large variety of habitats, from mountains and cliffs to sandy beaches and wide plains, the Balearics have a wide diversity of wildlife including some rare birds and reptiles. There are some 1,500 species of flowering plants on the islands, of which 50 or so are native. Some of them grow only in Mallorca and the Cabrera archipelago. Most flower in spring and at this time the islands are a blaze of colour. For the rest of the year, the islands are green, but the sun-bleached foliage is no longer quite so lush. 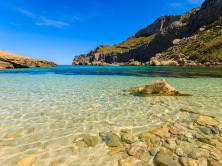 The coastline of the Balearics is varied – featuring sandy beaches with shallows stretching far out into the sea, and cliffs with distinct layers of rock, full of cracks, niches and caves. The water surrounding the islands are too cold for coral reefs. The only variety found here is the soft gorgonia. The sea grass meadows are home to a variety of animals from lugworms to fish. The rocky sea bed supports the richest variety of life. Here you will find varieties of molluscs, starfish, lobster and fish – from the smallest goby to the giant grouper. The islands have long been a draw for artists. Frederic Chopin came to Valldemossa on Mallorca, though the weather was far from ideal [one of his Mallorcan compositions was the Raindrops Prelude]. The picturesque village of Deia was, for many years, the home of the English writer Robert Graves, whose guests included Pablo Picasso and the actors Alec Guinness and Peter Ustinov. The most famous artist associated with Mallorca is Joan Miro, whose works can be seen in the Fundacio Pilar i Joan Miro, on the outskirts of Palma. A Balearic Islands holiday will mean a huge variety of water sports, particularly the many races held on the water of the Bahia de Palma. The most important of these are held under the patronage and participation of King Juan Carlos. They are attended by leading members of the yachting world with big events celebrated as public holidays. However, the true local passion is football. Real Mallorca, based in Palma, is one of the leading Spanish sides and won the 1998 Spanish Cup. It is worth attending a match, not just as a sporting event but to enjoy the good-natured enthusiasm of the crowd. Other sports strongly associated with the Balearic Islands including yachting, wind-surfing, horse riding and golf. Excellent golfing conditions exist in the islands, even in winter. Hours of Sunshine: During July and August, there are nearly 11 hours of sunshine daily. Not surprisingly, these months coincide with the peak of the tourist season. Fewer sunny days occur in November, December and January. At this time of the year the islands are at their least attractive. Temperature: Temperatures on your Balearic Islands holidays rarely fall below zero. This happens only occasionally in December and early January. For this reason, many people enjoy out-of-season visits. Summer temperatures may soar to 40°C. Rainfall: The lowest rainfall is in July and the highest between October and December. Storms are rare in the summer. Visitors should bear in mind that in the mountainous regions, clouds may be thicker and rain more frequent than in the coastal area.